Photo courtesy of Zachary Tomlinson. Sometimes you have to do things that make you feel uncomfortable when you make decisions to take your writing to a different level. For me this involved a recent foray into journalism. I normally adopt an “I’ll-leave-your-opinons-alone-if-you’ll-leave-mine-alone” stance when it comes to politics. I’m honestly very middle of the road. My philosophy is very much like Neil Gaiman’s: “If there was a party whose main platform was being nice to people, freedom of speech and supporting libraries I’d sign up for it.” I don’t get into virtual, all-caps-on, shouting matches on Twitter or Facebook over politics. I just don’t think that it does much good. I may occasionally repost a meme about teachers getting the fuzzy end of the lollipop or internet privacy or censorship. Those are my pet peeves, but I don’t do it very often. But when an opportunity of a lifetime emerges, a chance to also test myself as a writer…well some things are just too good to pass up. I almost enrolled in journalism school ages ago…years before the major life change I made two years ago to go back to school at forty-something to get my Masters in English Literature. But life happened…I got a full-time job, got married, and didn’t do journalism school. So, recently, when the guys at The Sandbox news asked me to write some articles (book reviews were discussed at the time) I said I’d do it. Partly because my writing has been in an idle place and I’ve been looking for some way to rev it up a notch, but mainly because I always wanted to write for the school newspaper, and when I first started at SPC, they didn’t have one. Then…an amazing thing happened. 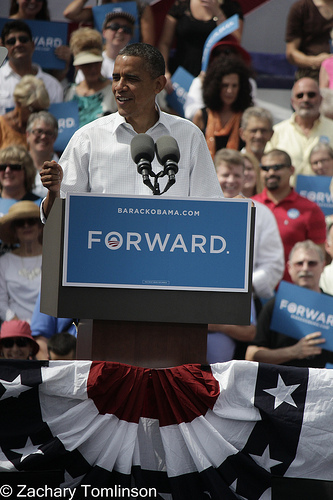 Just a few days later we received the news that President Barack Obama was coming to deliver a Grassroots speech at our campus in Seminole. And I was asked to go along with the other reporters and cover it. Me! See a president of the US give a speech! I was overwhelmed and more than just a little bit scared. I don’t do politics, remember. After I calmed down, I reasoned that a chance like this doesn’t come along very often and it was not just an opportunity to see a US president make a live speech, it was also an chance for me to write a journalistic piece…write it to the best of my ability, all the while trying not to air my own political views. It was, not to put too fine a point on it, a challenge…and there’s nothing I like more than a writing challenge. We writers need to challenge ourselves, and sometimes that means stepping outside of our comfort zone and writing about things we’d normally steer well away from. So I wrote this…my very first experience with writing for the mass media. 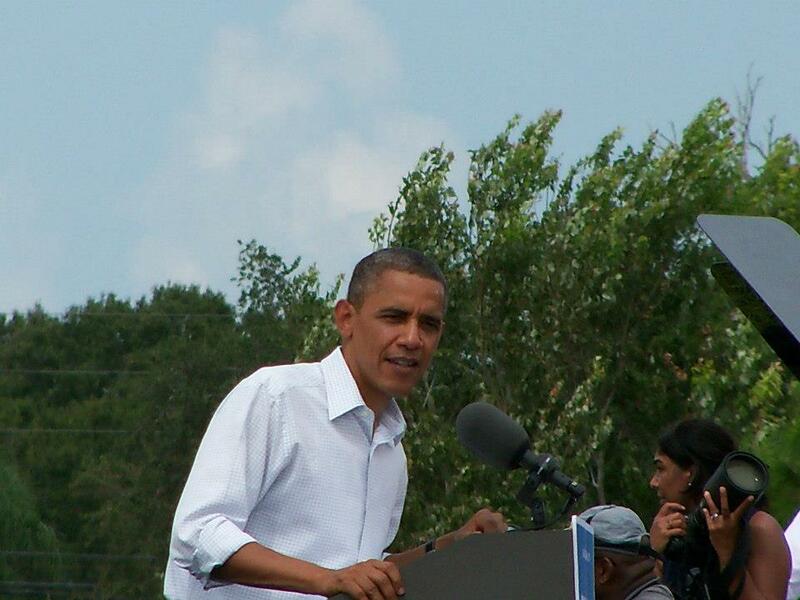 I hope you enjoy it: The President Visits Seminole, Emphasizes Education. Image courtesy of Maggie Susens Livingston. Just before New Year’s Day, I wrote a bold as brass blog post. I laid claim to the dragon year 2012 and made plans to burn, burn, burn, with a passion and fire like never before. I have to say after three months, 2012 has not let me down. It’s difficult being both a scholar and a writer. Sometimes I’m not sure where one part of my dual life ends and the other begins, as the two seem intricately interwoven and dependent upon each other to make me a whole being. To teach my passion for literature and writing, I work relentlessly toward a Master’s degree, perhaps even a PhD. I write on the side for pleasure and profit when I can, and I write as part of my school work. Sometimes the two join and become one thing, like when I won the “Best Fiction Short Story” award at the Phi Theta Kappa Florida Regional Convention in Jacksonville a few weeks ago. Hearing my name and story called was like nothing I’ve ever felt. It was one of the most euphoric things I’ve ever experienced. I want more of it. Also, on the scholarly side of things, I was nominated by my school for the All-USA Academic Team. I get to go to Orlando in a few weeks and accept a medallion and certificate that’s the reward for the years of hard work I’ve put in to become a top student. I didn’t make the All-USA final team, but the benefits of being named to an All-State team are being made clear to me. I was getting emails and letters from interested transfer schools before, but now there are an increasing number of schools wanting me to consider them for my baccalaureate degree. Good things, I think, will continue to happen to me as I inch ever closer to my dream of being a professor. Now for the writing side of my life. What writer on earth doesn’t want their stories to come to life on screen? I was notified about a week ago that my short story Sophie Solitaire: Confessions of an End-Time Girl was chosen as one of ten stories in Literary Mix Tapes Nothing But Flowers anthology to be included in a movie project. Finally, late last year I posted a previously published short story to the Friday Flash community, which I’ve been involved in for about two years now, although not as regularly as I’d like these days. I then submitted the story for possible inclusion in the second Friday Flash anthology: The Best of Friday Flash, Volume 2. I just received an email from Jon Strother at Friday Flash this morning to let me know that my story, The ABC’s of the Apocalypse, will be included in BOFF2! I’m wildly excited about seeing this story in print again. It is one of the best stories I’ve written, and it received a lot of great comments when it was posted for Friday Flash. Needless to say, I’m looking forward to what the remainder of 2012 brings! 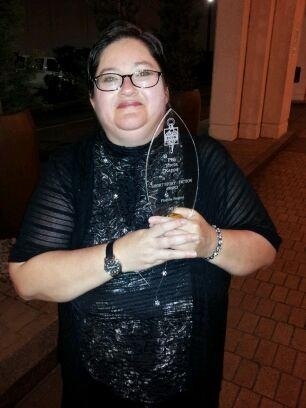 My award for PTK Florida Region Best Short Story, Fiction.